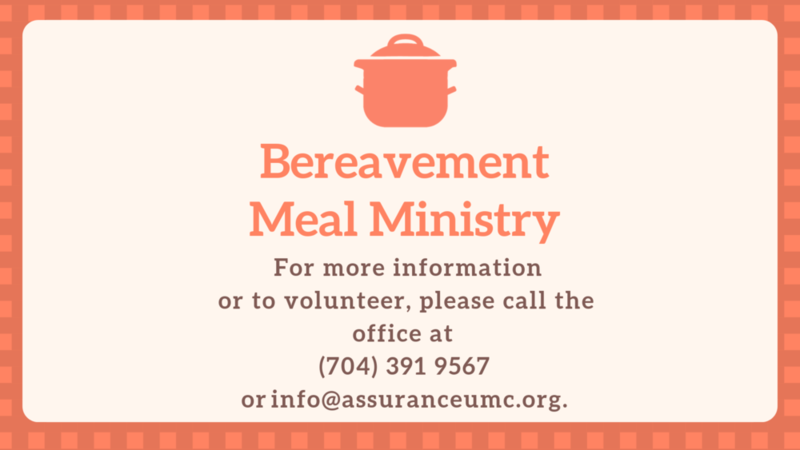 The Bereavement Meal ministry is a service we lovingly provide for families of Assurance after the death of a family member. It involves providing a meal before or after the funeral service, either at the home of the family or at the church. We are looking for volunteers to help with this ministry, either through the preparation of the food for the meal or through the setting up, serving, and cleaning up of the meal. We have changed the way people volunteer to help with funeral meals in our church. In the past only circles prepared and served meals before or after funerals. Now the whole church can help with this process. First, you must add your name to the Bereavement Meal Ministry group on MyAssurance. Then if a family requests a meal, Dianne Beam will send out an email to the group. If you would like to help with the meal, respond by selecting what you would like to bring and or how you would like to help (such as set up tables). You do not have to help every time, just when you are able. This is a meaningful ministry and greatly appreciated by the family. But we need your help to make it work. Thanks so very much.